The release of the final release for GDP and the international investment position provide an opportunity to assess progress on the trade war. Last week's release for January 2019 trade data also allows for a finer-detail look at the war to export more to China. The export series shows little evidence of recovery (although the seasonally adjusted series has stabilized at roughly 40% lower than peak levels). Editor's note: This article was originally published on April 1 by Menzie Chinn here. 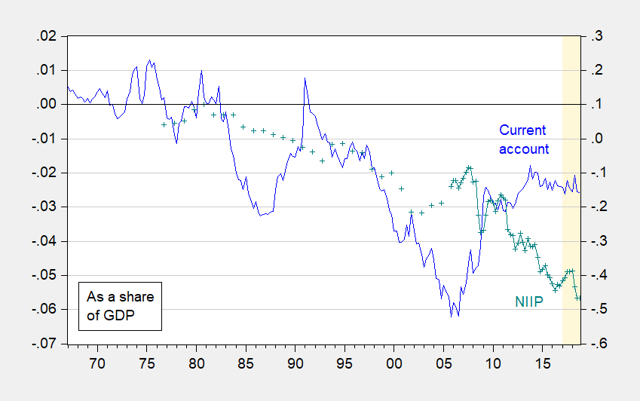 The release of the final release for GDP and the international investment position provides an opportunity to assess progress on the trade war. I for one have gotten tired of "winning." Figure 1: Current account (NIPA definition) (blue), and Net International Investment Position (green), both as a share of GDP. Orange shading denotes Trump administration. Source: BEA, 2018Q4 final release, 2018Q4 international investment release, author's calculations. 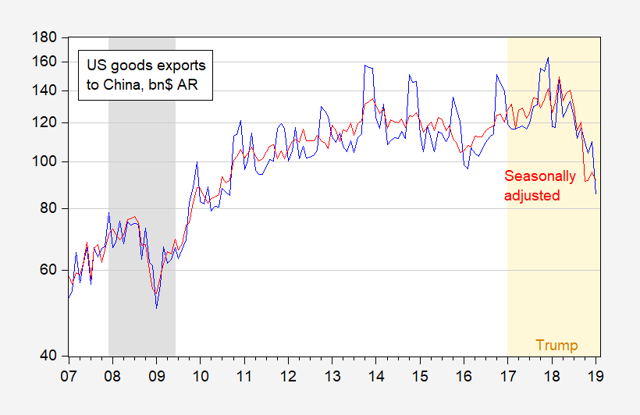 There's been some volatility in trade flows in recent quarters; it's likely that that is partly due to the timing shifts aimed at avoiding Chinese tariffs. Note the spike in net exports in 2018Q2. 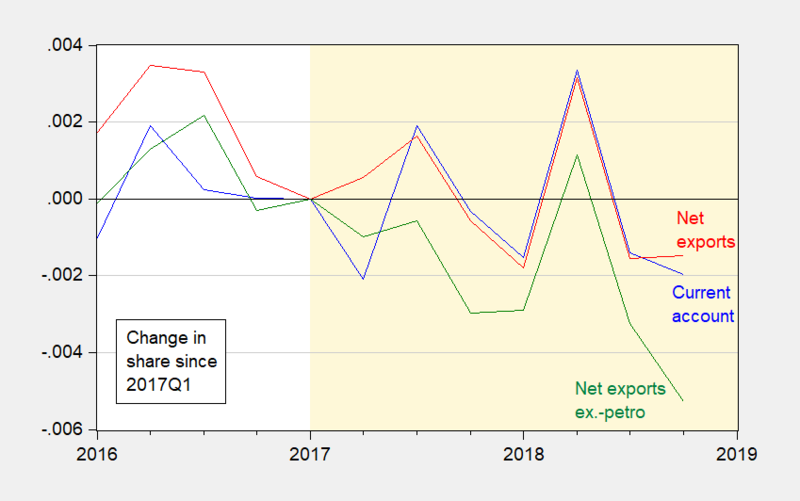 Figure 2: Change in current account (NIPA definition) (blue), net exports (red), and net exports excluding petroleum (green), as a share of GDP, since 2017Q1. Orange shading denotes Trump administration. Source: BEA, 2018Q4 final release, and author's calculations. Figure 3: US exports of goods to China (blue) and seasonally adjusted (red), in billions of US dollars, annual rates, on log scale. NBER defined recession dates shaded gray. Orange shading denotes Trump administration. Seasonal adjustment implemented using X-13, ARIMA X-11. Source: BEA/Census January international trade release, NBER, and author's calculations. The plummet in exports is glaring. The export series shows little evidence of recovery (although the seasonally adjusted series has stabilized at roughly 40% lower than peak levels).